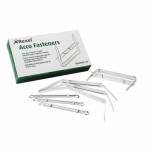 Rexel Fasteners 80x50mm Steel (Pack of 50) 70850 Pack of 1 Acco Filing Clip. 8cm gauge file fastener for papers with standard two hole punching and expands to hold punched paper up to 51mm thick. Ideal for use with pre-punched square cut folders. Pack of 50. Q-Connect Binding Ring 19mm (Pack of 100) KF02216 Pack of 1 Q-Connect Binding Rings. 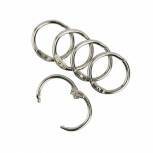 Metal 19mm binding rings ideal for holding punched pockets, papers, hanging displays and sample swatches.